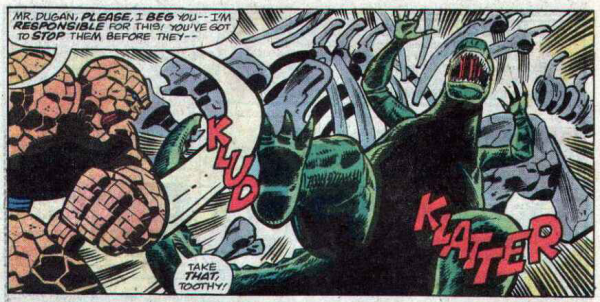 Ben Grimm punching Godzilla into a T-Rex skeleton decades before Jurassic Park! A Night at the Museum, huh? Will Ben Stiller be guarding Godzilla? No, guess not. When last we left Big G, the monster was about six feet tall and wandering around New York City, randomly flashing people and slowly growing by spurts back to his normal size. As of now, Godzilla just shot up to 20 feet tall, which is big enough to scare angry traffic jam commuters. Keep in mind, these are people who live in New York while the Avengers, Fantastic Four, and Spiderman are fighting giant things all the time. 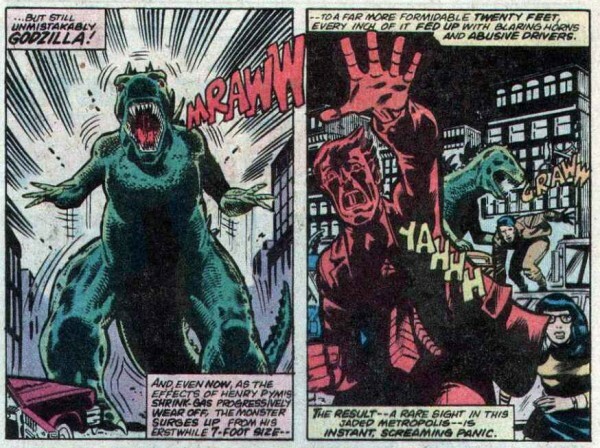 The new SHEILD plan is to use flare guns to lure Godzilla to the museum they were going to take him to anyway. Once again, no one seems to think that maybe having Godzilla in the most populous city in the US isn’t a good idea. And at the museum, Godzilla can smash a while bunch of priceless artifacts! I can see how this is a good idea, if you are planning to steal the artifacts in the museum and have fakes ones destroyed to collect the insurance money. Not that I think any character is doing something so nefarious. 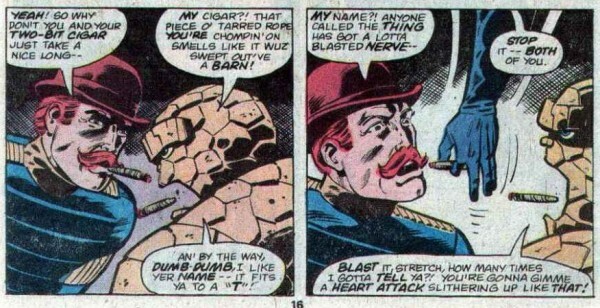 Ben Grimm (aka The Ever-Lovin’ Blue-Eyed Thing!) 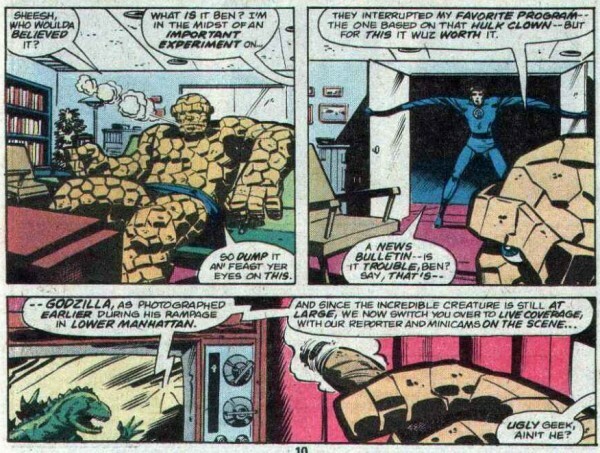 sees the commotion on the tv, and soon the Fantastic Four have sprung into action. Dum Dum and Ben Grimm to not like each other at all, which isn’t surprising considering every super hero who has gotten involved with Godzilla has just been in the way, causing more troubles than they solve. 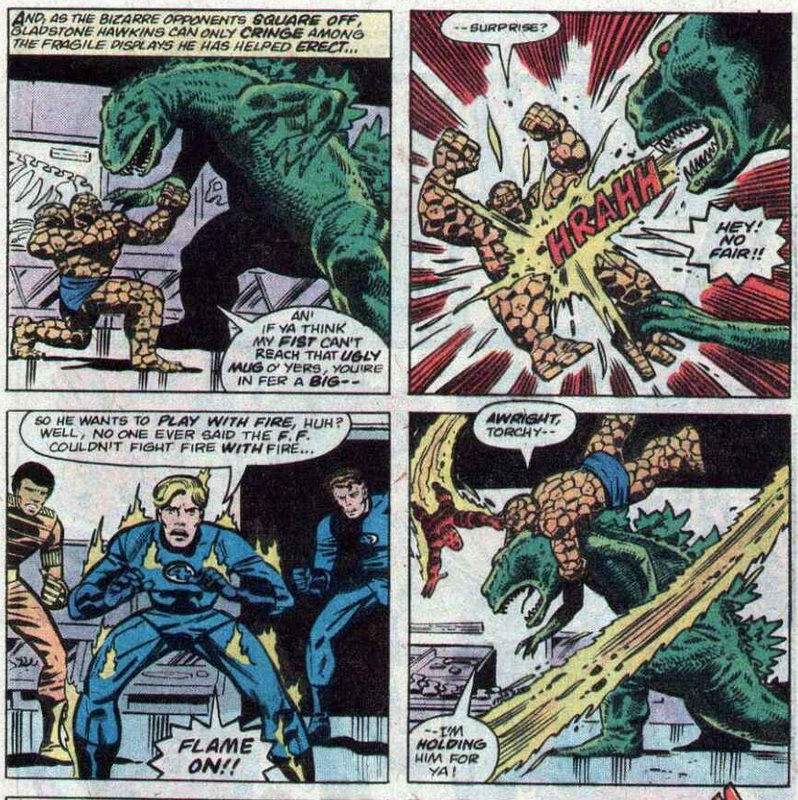 Soon Ben gets accidentally hit by Godzilla’s tail, and fighting begins. 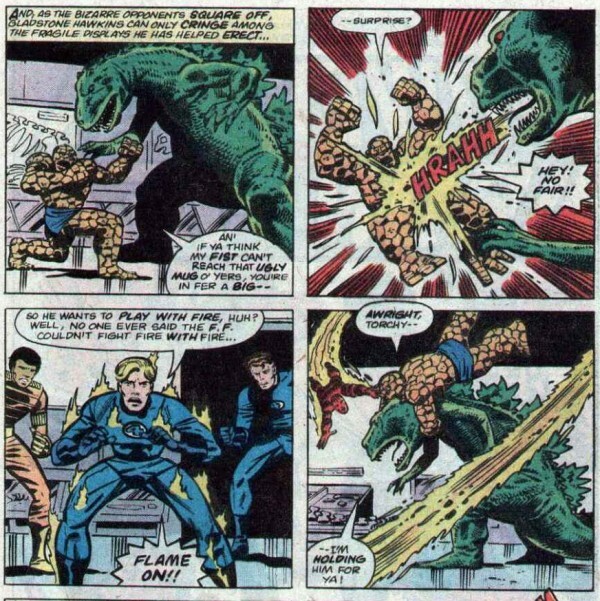 Dum Dum and team just watched the Fantastic Four battle Godzilla through a museum, at this point he’s probably resolved just to let his enemies tire each other out before he whomps them both. 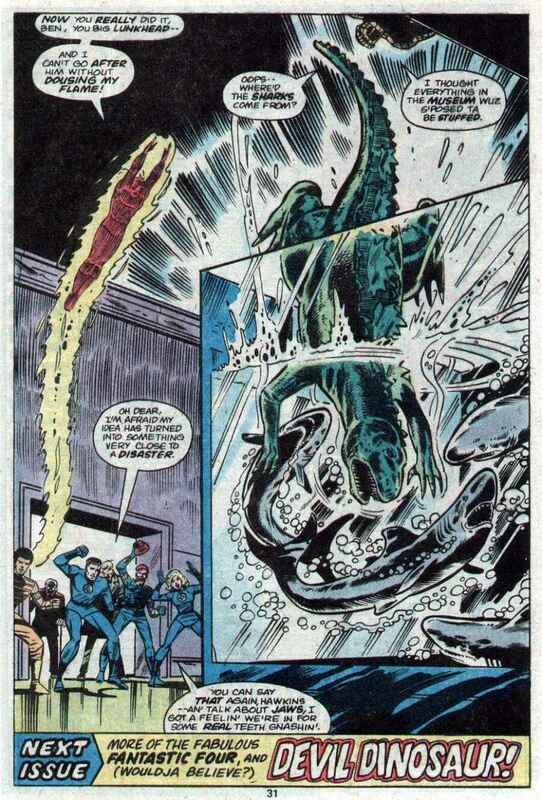 We get a cliffhanger when the Thing knocks Godzilla into a shark tank! Will Godzilla fight a shark while he’s still small enough to almost be affected by shark bites? 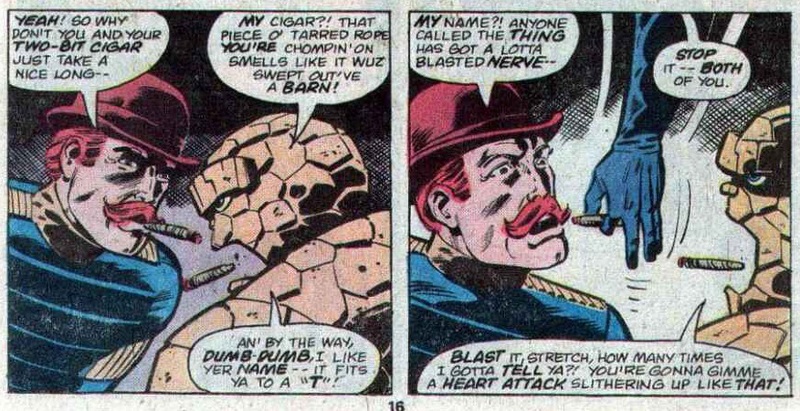 I predict things won’t be as exciting as they seem, and Ben Grimm is all rocks, so there is no way he should be worried about sharks. But he should be worried about Red Rock Eaters. Until next time, stomp on! 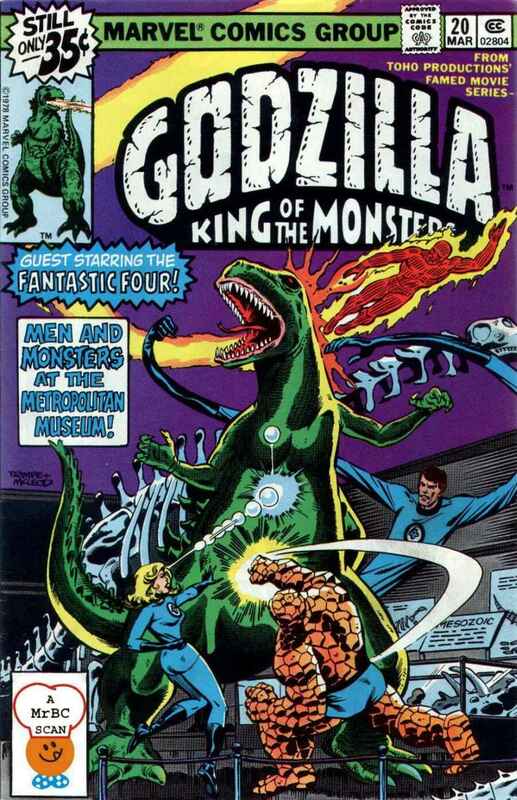 Remember to check out the Godzilla Marvel Splash Page if you are confused about all things Marvel Godzilla related. Godzilla interrupts results on Maury, and now The Thing will never know if he was the father! Godzilla had more blunts per panel than any comic in the pre-Kevin Smith age!